Soon I'll have an amazing finish for you, but in the meantime, I do have a few odds and ends to report! When we returned from Shepp Ranch earlier this week, one of the first things I did after loving Ms. Sophie and telling her how much we missed her was run outside to the garden and see how things were doing! What did I find, but my three pumpkins beginning to show signs of orange! I can't tell you how excited I was to see this! Mr. Squash has had a project this summer. 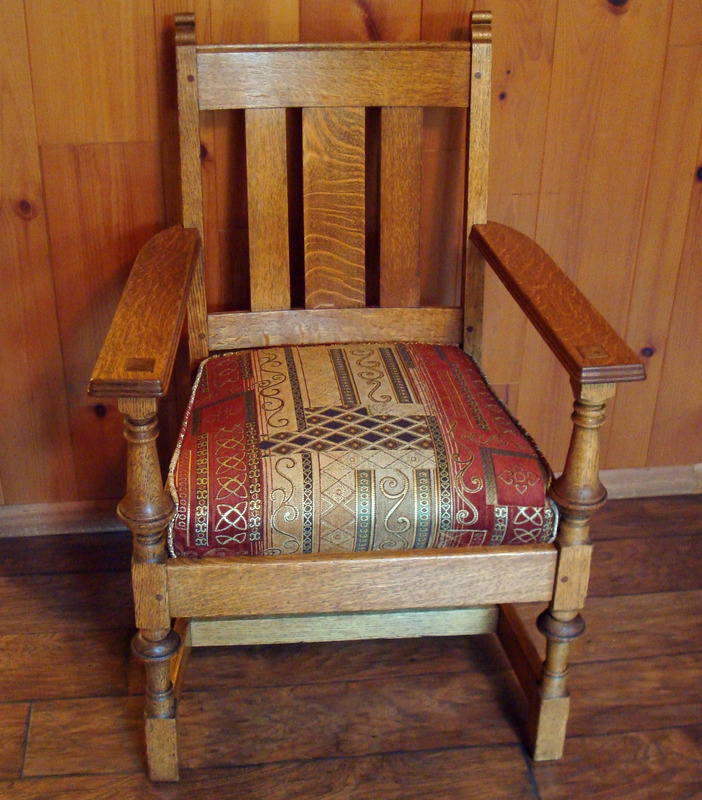 He bought an old, oak, captain's chair to refinish. It is in the Mission Style that we love and pretty old as a lot of it was put together with peg and tenon. When we brought it home it was stained in a very dark color and not in the best of shape. The cushion on it was covered in a fly fishing motif, but the cushion itself was tied together with some sort of electrical cord and in need of replacement! Mr. Squash stripped and re-stained the chair to a gorgeous honey color. We found some great upholstery fabric 40% off and JoAnns, then took it to an upholsterer to re-make the cushion. Here it is - looking like new! Mr. Squash does the best refinishing work! 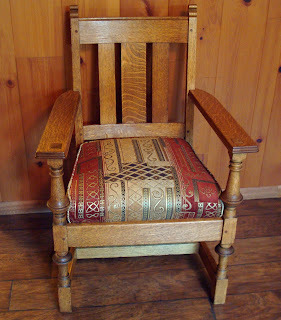 The chair will go with his antique desk for fly tying - a desk that we have yet to find! 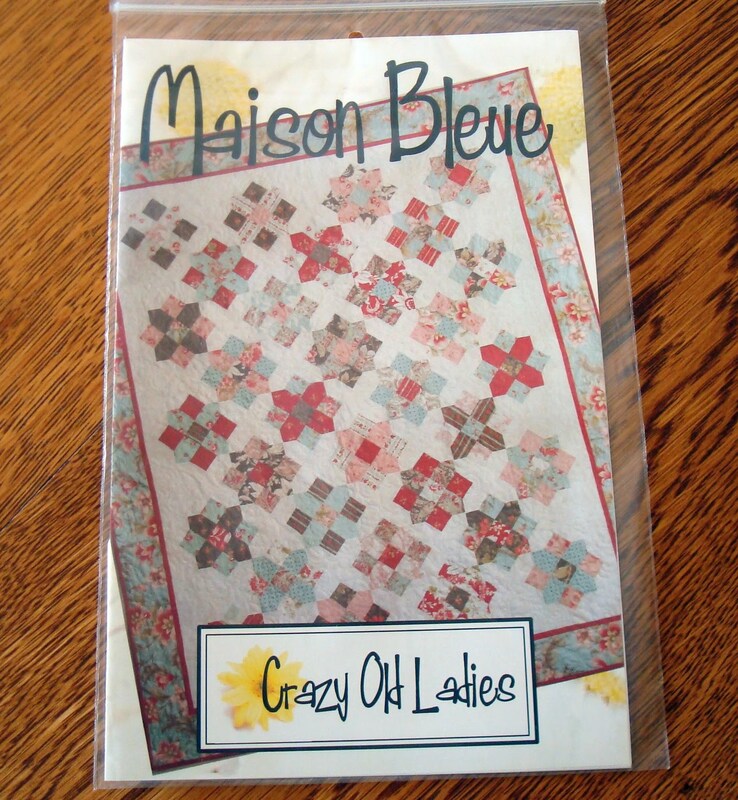 Kimberly and the gals at Fat Quarter Shop have to stop sending around such great newsletters - LOL! 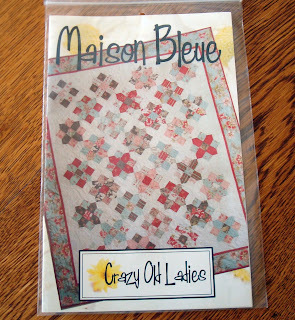 Their last one had this Maison Bleue pattern that I had to have! I plan to use Sweetwater's Pure line as soon as the yardage arrives in stores! That same newsletter had Luna Notte by 3 Sisters for Moda - I don't know what I will do with this gorgeous charm pack, but I do know there will be some more pattern testing in my future....always helps to have fabric on hand for that! That's all I have for now. Our former neighbor from the old house, her sister and friend are arriving in town tomorrow. I'll be tour guide for the weekend! Beautiful work by Mr. Squash! He will love the fly-tying when the fishing season is over. Your pumpkin looks like halloween to me. I love Mr. Squash's chair! The upholstery is really pretty, too. Love the fabric. Can't wait to see you amazing finish. Looks like you have some nice projects ahead of you, thanks to the FQS! Definitely Miss Sophie first then garden. I'm so excited about your pumpkins. What an absolutely gorgeous chair. I don't think the fabric for the cushion could have been any more perfect. Pretty charm pack for future testing. The chair is beautiful and the fabric looks perfect. What a find! If you get tired of it, I have some Mission furniture that it would look great living with! We don't have pumpkins growing where we planted them. But we do have them growing in one of the pastures! Lovely post! Wonderful chair...very clever Mr Squash! Garden photos are great! What a fun collection of new ideas/projects...can hardly wait until the next show-n-tell! Until the desk arrives, you can display the chair as art! Fantastic remake, it looks beautiful. 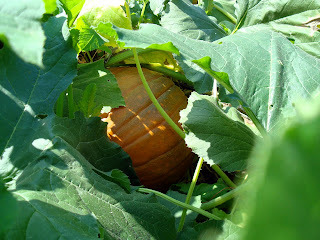 Your pumpkin is looking good--there is a field a mile away from us that is planted in pumpkins and like you, I was excited to see lots of orange bits among the green leaves. 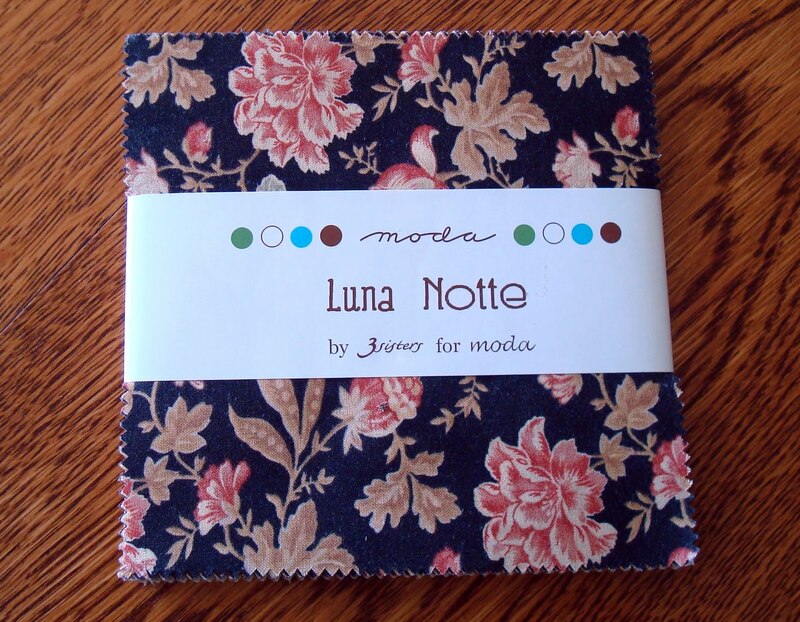 And the fabric and patterns--what fun you'll have with those pretties! All I can say is, "WOW!" The chair is beyond awesome. Super job, Mr Squash! After seeing your pumpkin, can Fall be far behind? We supposed to have another week of weather in the 90's starting tomorrow her in the great Canadian east. Yuk! That chair!!! It's a fantastic one! Enjoy the company this weekend. What a sweet pumpkin peeking through at the sunshine! The chair turned out so nice. It will be a treasure always. Can't wait to see that quilt out of Pure. I have some I haven't decided what to make yet. Have fun being tour guide! Hi Candace, I just found your blog and love all the pictures of you fly fishing. However, the first thing that caught my eye was your pumpkin. I have several maturing in CO right now and can hardly wait for the leaves on the Aspen to start changing. Mr. Squash did a fantastic job with the chair refurbishing! I've never attempted to do this myself as it's always seemed like so much work. Enjoy your week with your former neighbors! Love the chair. I'm jealous of your pumpkin. This is the first year in a long time that I didn't get a garden in, and I can't believe how much I have missed it! How exciting to see the pumpkins. Is it your first time growing them? Mr. S sure did a great job on the chair.